CHARLOTTE, NC--(Marketwired - Oct 14, 2013) - Between summer and the start of the holidays, things usually slow down, but at the Charlotte Marriott SouthPark, things are starting to heat up. Beginning on October 15, 2013, this hotel near SouthPark Mall will launch a 48-hour Fall Sale, with rates starting at just $99 a night. 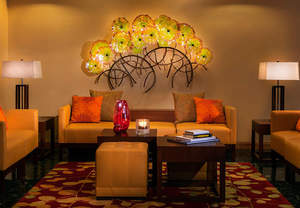 The fall season is the perfect time to experience this Charlotte, NC boutique hotel. At the nearby SouthPark Mall, visitors can get a head start on holiday shopping with more than 150 stores including Anthropologie, Apple, Brookstone, Burberry, Coach, Godiva, Louis Vuitton, Sephora, Sur La Table, The Art of Shaving and Tory Burch. Afterward, sit down for a meal at California Pizza Kitchen, The Cheesecake Factory or McCormick & Schmick's. Those who want to spend time outdoors before it gets too cold can head to U.S. National Whitewater Center, offering canopy tours, whitewater rafting, stand-up paddle boarding and other adventure-filled activities. Its Zipline & Dine incudes a zip-line excursion followed by a fireside dinner with wine and craft beer. Other dining opportunities are also available onsite, including the new Pumphouse Biergarten. Fall will also host some of the biggest names in entertainment at the Time Warner Cable Arena, conveniently located near Charlotte Marriott SouthPark. Those who would rather scream in fear than as a fan should head to Carowinds theme park for its annual SCarowinds' Halloween Haunt, featuring thrill rides, shows, mazes and more; the event is so intense that kids must be 13 years or older. To take advantage of this limited time offer, visit http://www.marriott.com/hotels/travel/cltph-charlotte-marriott-southpark/ and use the code ADP. Available only during this limited time, sale rates may be booked online at between October 15 and October 17, 2013. *Rates are per room, per night based on availability at the time of booking. Rates are non-refundable. Offer not valid for groups of 10 or more rooms and may not be combined with any other discount or promotion. Marrying European sophistication and Southern charm, the Charlotte Marriott SouthPark offers a boutique hotel experience in the heart of one of the city's most affluent neighborhoods. Outfitted with modern furnishings, eclectic art and state-of-the-art business amenities, the hotel is a top choice for both business and leisure travel. Guest rooms offer a spacious desk, high-speed Internet access, coffee/tea service, 32-inch HDTV and luxurious bedding. For active guests, this SouthPark Charlotte hotel offers a seasonal outdoor pool, fitness center and sauna and whirlpool for post-workout relaxation. Those who prefer to get their exercise outdoors can head to the U.S. National Whitewater Center NC for rafting, biking, climbing, zip lines, eco-trekking and more. Visitors can also explore dining, shopping and entertainment nearby at the Specialty Shops on the Park, Carowinds Theme Park, Bank of America Stadium, Time Warner Cable Arena and Charlotte Bobcats Arena. For a delicious in-house meal, the European gastro pub Rexford Park features innovative twists on American classics. Those looking for a special venue for a meeting or event can book this hotel's 8,750 square feet of event space. Between summer and the start of the holidays, things usually slow down, but at the Charlotte Marriott SouthPark, things are starting to heat up. Beginning on October 15, 2013, this hotel near SouthPark Mall will launch a 48-hour Fall Sale, with rates starting at just $99 a night.